Kanthar Sashti Kavasam is a famous Tamil hymn in praise of Lord Murugan. It was composed by Sri Devaraya Swamigal and helps one to obtain the grace of the Lord. It is sung particularly on festive occasions, such as during Kanthar Sashti in October-November. When chanted daily with concentration and devotion, the kavasam serves as a protective armour for devotees and confers great spiritual and material benefits. This rare and valuable treasure helps one to be successful in our daily lives. 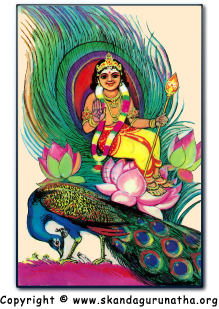 In Kanthar Sashti Kavasam, the author prays to Lord Muruga to shower His grace. Regular chanting of this kavasam has been found by devotees to resolve all their life's predicaments: people without children enjoy fertility; prosperity and plenty abounds; and peace prevails at the home of sincere devotees. The devotee will enjoy every good fortune under the sun. As a warrior going to battle puts on armour to protect himself, so Kanthar Sashti Kavasam helps one to be safe in day-to-day life. Kanthar Sashti Kavasam is the work best-known by devotees and is dedicated to Lord Murugan of Thiruchendur. However, Devaraya Swamigal composed five other kavasams (a total of six) for each of Murugan's Six Abodes  Aarupadai Veedu. These kavasams can be viewed here (courtesy of the ProjectMadurai.org website).